RBI News on Bitcoin – What Bitcoin Future in India Looks Like? It isn’t a secret that Reserve Bank of India (RBI) has never been a big fan of Cryptocurrencies. In the past, the central bank has given fair warnings against investing in the likes of Bitcoin due to its high volatility and speculative nature. Even then though, the number of crypto-investors continued growing in the country. However, the latest RBI announcement on Bitcoin can be a major blow for the entire community in India. RBI has banned all entities (that are regulated by them) from dealing with individuals and businesses that deal in digital currencies. The institutions that are regulated by them includes the majority of Indian banks, digital payment solutions, and e-wallets. Meaning, while you would usually transfer money from your bank account or e-wallets (like PayTM) to your account on cryptocurrency exchanges before purchasing your currency, this won’t be possible now. Because RBI has barred your bank from dealing with and providing services to your crypto-exchange. 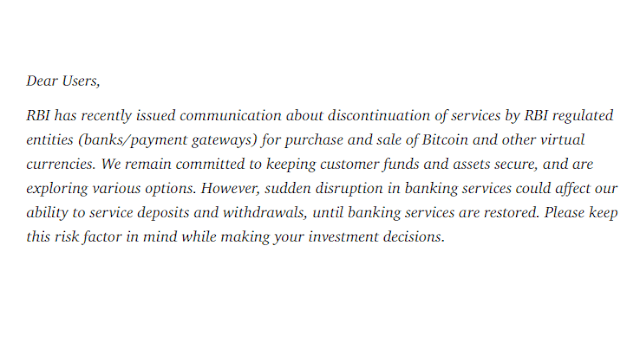 So if you can’t transfer and withdraw fund to and from your crypto-wallet, you won’t be able to buy and sell Bitcoin or any other Cryptocurrencies for that matter. The directive comes with an immediate effect. 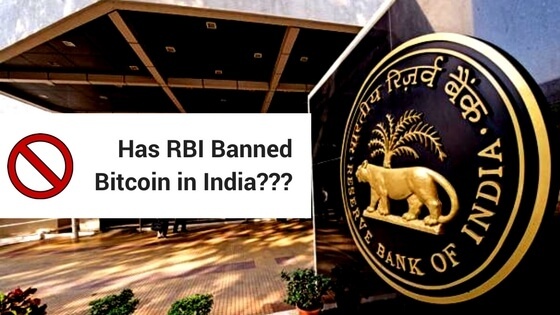 However, RBI has given 3 months to all the financial institutions to stop doing business with the cryptocurrency exchanges. In this span, you can convert your holdings into INR without any fuss. Surprisingly, RBI hasn’t yet released any Press Release on this matter. Is Bitcoin Banned in India? The central bank of India has clearly asked other banks to stop facilitating the purchase of VCs and other such tokens. At such time, it is important to address this major question whether Bitcoin is banned in India or not. Purchasing Bitcoin, or any other cryptocurrency, is still not banned. In the lack of proper regulations in the country, Bitcoin is STILL neither legal NOR illegal. So you can actually buy and sell your cryptos without the fear of breaking any law. Many cryptocurrency exchanges have responded to this major development in their own ways. Koinex has said that it will continue working with industry leaders to find a solution to this problem. In one of its articles, it has said…. Other exchanges, too, have made many similar statements. Bitcoin is NOT illegal in India. And neither is buying and selling any cryptocurrency has been banned in the country. RBI has formed an interdepartmental committee who will come with a report by the end of June 2018. The report will outline how the central bank will be dealing with Cryptocurrencies. So it is only then will be the fate of VCs will be decided. Finance Minister Arun Jaitley, too, has said weeks back that his ministry has formed a committee who are trying to figure out how to deal with the Cryptocurrencies. The report is still due. So all that we, from Bitcoin India Wiki, say to you is avoid panic selling. Just sit back and relax. Indeed the future of Bitcoin in India is in a critical state. However, nothing is confirmed yet. The state of cryptos in the country is still just the same how it was a year back. It’s just that, with the latest directive from the RBI, buying the likes of Bitcoin, Ripple, and Ethereum have gone tougher. But given top exchanges have made positive statements, they would definitely come up with ways to resolve this problem. There are institutions and digital wallets that aren’t regulated by the RBI. They can play a big role here. Besides, even if things get banned, you can still purchase Cryptocurrencies in India through PayPal. Also note, if you decide to panic sell now, you’re only going to end up with a big loss. Because let’s admit it, Bitcoin and other currencies aren’t having one of their best days. Their price is continuously falling. If you sell now, you would be selling at a loss. And that’s something you shouldn’t do when dealing with Cryptocurrencies. So relax and wait for the reports of RBI and Finance Ministry. Even if they take some drastic measures, the users will likely get a good buffer period to sell all their holdings and get their money back. And meanwhile, trust your exchange. They sure will come up with different ways how you can transfer your funds from your bank account to your crypto-wallets, and vice versa. Join the conversation on India's leading Bitcoin India Forum.